This is a I’m-trying-to-hang-onto-summer dish. 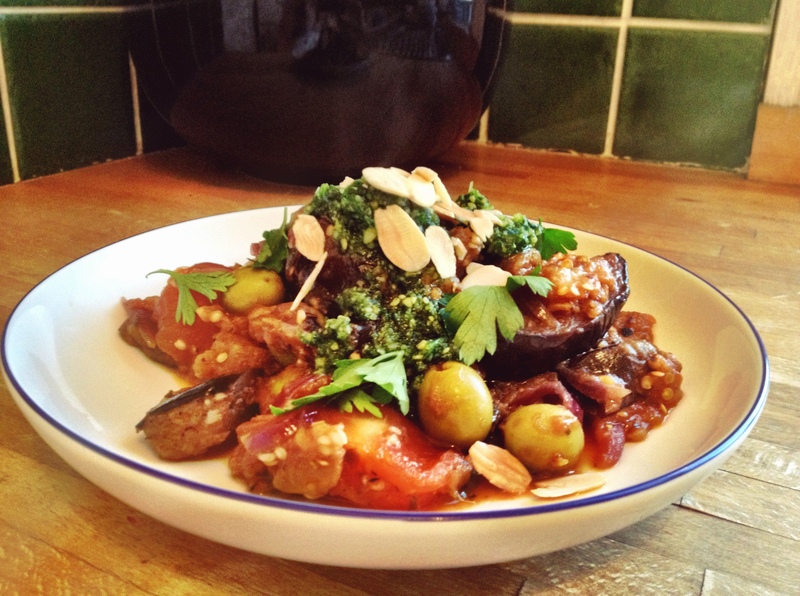 A sort of caponata-inspired aubergine stew, topped with fresh parsley pesto. So what’s in the stew? Well, as with caponata, the vinegar is pretty important here. You want a tart, sour tang. There’s also salty olives and anchovies (you could use capers instead, which is the traditional choice – I just didn’t have any! ), plus a fruit sweet hit of dates. The dates and anchovies melt into the sauce, an act as flavourings and seasonings – they make it so yummy! Otherwise, it’s a straightforward recipe that I really enjoy making a big batch of as it’s a good lunchbox filler and improves with age. The recipe below makes enough for 5-6 portions. Oh and a note on the pesto – my measurements are very loose because I just freestyled this one! I agree with Deena. Would love a large dollop of pesto with this. Must revisit my caponata and, like you, add pesto that I’ve been meaning to make to use up my Greek style basil – which is looking a mess right now! I would really recommend it – basil would be perfect! Everything’s better with pesto – I love it stirred into tomato based soups! I love everything in this, looks delicious! Thanks Anna, it really was. I might have to make it more often!